On Tuesday 17th March, I attended the inaugural Torbay Culture Forum Event – ‘Culture: Living Well.’ A conference focusing on the cultural strategy programme ‘Enjoy, talk, do, be’ a framework that ‘represents a key opportunity to harness the value of culture and create conditions in which to address post-recession challenges in imaginative ways.’ (part of Strategy Summery, read the full strategy here). As the first event of the Torbay Culture Forum, the day’s discussion looked at the relationship between culture and health. The idea was to create an open dialogue between the public health sector, individual arts practitioners and cultural and public service based organisations, in order to explore how the wellbeing of Torbay could be improved by collaborative efforts and initiatives. The day started with a promisingly creative task to kick start our creative thinking, in pairs we were asked to come up with as many different uses for a variety of objects; ranging from chopsticks, to pipe cleaners to elastic bands. We worked in pairs, aiming to merge our imaginations with those from different professions and come up with collaborative ideas. Following this was a presentation from Dr Derek Greatorex – Interim Chief Clinical Officer of South Devon and Torbay Clinical Commissioning Group, as a GP he explained the context of health in Torbay, particularly focusing on the elderly population which account for over 45% of the population in the area. He explained that around 10% of people over the age of 65 in the UK are lonely and that this can be the cause of several health risks. Dr Greatorex also expressed his desire for cultural activities to play a larger part in the traditional health system, suggesting that they could be an alternative prescription for those suffering with loneliness, anxiety or depression. Ruth Ben –Tovim from the Torbay Community Development Trust, supported this idea and introduced us to the ‘Ageing Well’ project. The programmes objectives were based on firsthand accounts from older people in Torbay, which included making sure people feel their lives have value and purpose, allowing them to feel connected with their communities and friends. It was suggested that these objectives could also be supported through cultural activities. After this Dr Dan Bloomfield from the University of Exeter spoke about ‘The Dose of Nature Project’ – a research initiative exploring how patient well being can be improved through greater connection with the natural world. This could be in the form of a group walk on Dartmoor or a visit to the seaside. Lisa Tregale from the Bournemouth Symphony Orchestra also echoed the idea that culture can be beneficial for health, this time using the example of forming an orchestra with people suffering from dementia and the positive effects this had on both their moods and general well being. 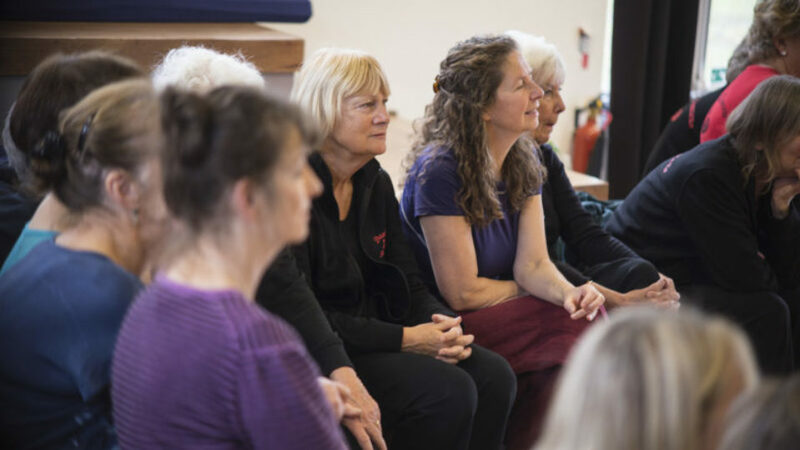 These talks were fascinating and the ideas felt extremely relevant to the work we do at Dance in Devon, particularly our recent Silver Dancers Project, during which dance practitioners worked with older people in residential care homes across Devon. The afternoon brought round table discussions, exploring the ideas from the morning and looking at how Torbay could best utilise them. The main focus was based on how communication between the two different sectors could be improved, thus helping to ensure cultural events were well organised and promoted. We also looked at the idea of intergenerational activities and how this could not only benefit older members of the community but also those from younger age groups suffering with health problems. The conference was interesting and a great opportunity to network with practitioners and organisations, allowing possible future collaborations or projects. It gave me inspiration and confidence that culture can work alongside traditional healthcare and create greater wellbeing. The discussions and ideas of the conference will be followed up by the newly formed Torbay Culture Board.